"My name is Sam Jenkins, I am 13 years-old. I went hunting with my grandfather, Fred Servello, on youth turkey hunting weekend. "We got out there in the woods at about five am on Sunday morning and there for about an hour calling and calling and we would hear nothing. "My grandfather asked if I wanted to go to a different spot. I said yes so I stood up slowly just in case something was on the other end of the field that we couldn’t see while sitting down. I saw 3 little black spots on the other end of the field. I told my grandfather to get the binoculars so we can see what they are. "Turns out there were two hens and one big gobbler that was all puffed out. My grandpa said let’s cut back through the woods to get to the corner to see if we can call the hens in to see if the gobbler would fallow. "We cut though the toughest brush and I fell into a stream that was about knee deep and got soaked from mid shin. We get to the corner and we see nothing and then my grandfather sees them in the other field. We got all flustered to try to find out what to do. All of the sudden we see this one lone turkey running up the bank. "I get down and got my gun ready while my grandfather calls him in. He comes running to about forty paces. I wait until he gets a little closer at about 30. My grandfather says are you going to take the shot or not whispering into my ear. I aim to the bottom of the head, as I am doing this my heart is beating a mile a minute about to come out of my chest. "I fire and it drops, it gets about four flops and it was done. 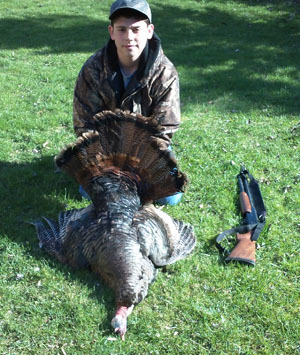 "I run up to it so pumped that I got my first turkey. I pick it up and it was a good 15 to 20 pounds. My grandfather gives me a high five and congratulates me on my first turkey."